Images on a tapestry depicting an African village. It was August 2008, and I was on a rickety bus somewhere outside Arusha, Tanzania. Much to my chagrin, I had had to take a seat toward the back of this bus. Thankfully, I was well-loaded up on drugs from being very ill with some form of parasite or amoeba after having summited Mt. Kilmanjaro. Otherwise I would have probably been more worried about my horrendous motion sickness, especially in the back. The drugs did not prevent me from waking up screaming at one point, although I did go back to sleep immediately (and yes, for some reason I do remember this, although it was also confirmed by my friend traveling with me). However, I survived, and we eventually made our destination Zanzibar. And any way, I want to write about a far more interesting story. How Does This Relate to Communication? I want to tell you about the small villages that we drove past in this rural area. From the bus, I had a view of mostly desolate dry land and every so often a few homes clumped together and then sparseness again. Sometimes I saw people and animals; sometimes gardens and children. 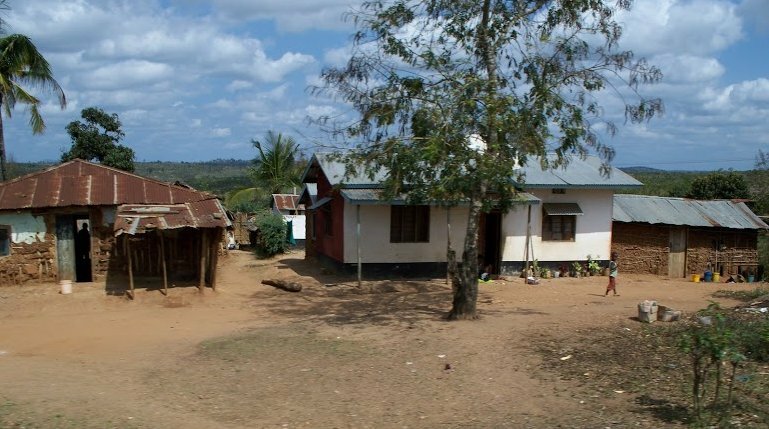 A rural village in Tanzania. In my head, I wrote a story, a story of how a mobile communications company, Vodapod (before, you ask, I don’t remember how I picked that name), changed the lives of people in one of these small villages. Representatives from the company researched the traffic patterns on the larger roads in the area while searching for a prominent place to put a sign advertising Vodapod (yes, one of those horrible highway signs that dirty up the landscape). After long negotiations for the perfect spot, they agreed to pay, what was for them, a small sum to the village yearly. Plus they also gave away mobile phones and contracts to the villagers. This money, but also this form of being connected to the world, changed life in that village. It also changed that village’s relationship with other villages. While this particular instance is just a story, I’m not entirely sure it hasn’t happened somewhere: What first appears as one small shift in communication has massive ramifications for many people. We’ve moved increasingly more from postal mail to telephone to computer, to laptop, to mobile phone. In some cases (and definitely across Africa) mobile is more frequently used than a laptop. When we replicate this small shift on a broader scale as we have done during the past few decades, we can only just begin to imagine how many people it affects. These new communication tools bring many opportunities to reach people. But it also brings challenges in understanding how to do this. As I mentioned before, there is a barrage of information coming at us constantly online. How can we break through that barrier? You might already have heard that nonprofits, such as charity: water and Greenpeace, as well as the business Zappos, have had success doing this using social media. But smaller businesses have also had plenty of success. Check out the write-up here (scroll to number three) about Giantnerd, a niche business that sells outdoor equipment. It doesn’t matter that you may have never heard of them; they’re catering to their niche of fans and it’s working for them. I also like the piece about the social media strategy firm, Convince & Convert (number five). That’s also because I recently heard this awesome podcast with the founder Jay Baer. (There’s also a huge list of case studies from Ventureneer). Providing all these examples does not prove it’s easy; in fact, it’s difficult. What works for others will not necessarily work for your organization. These cases can be studied and adapted, but they can not be copied. Each strategy has to be tailored to fit that one organization based on its needs and audience. Still, this online world opens many more possibilities than we had before. Instead of just visiting a physical store, we can connect through email, or we can find its website, Facebook, Twitter, or other social media page. We can talk about businesses or organizations in many places across the web whether they are there or not. We’re not just a single customer or supporter anymore. We have a voice, and that voice has the possibility to reach thousands, or more. Over time communication has changed from person to person, to one village, to the world. What has not changed is that we still need to get our message out. How we do that has changed, and will continue to change. 1. You can’t avoid being online. Even if you consciously choose to avoid social media, chances are someone is still talking about you, whether it’s on a blog, forum, Facebook, or Twitter. 2. Organizations with blogs that create a dialogue are becoming the norm, instead of those that just push information out (via press releases or sometimes social media). Believe it or not, it’s not all about you, as noted in number two here in this great piece by Scott Donaton. 3. Organizations that have a rapid response to supporters or customers online (and those that avoid jargon language) are more common. With so much more competition online, it’s more important now. 4. Similar to what I noted above, good customer service is essential. People are much less willing to put up with bad service when there are so many easy options. Good and bad reviews online are easy to find. You must find time to pay attention to what people are saying. 5. Organizations are creating a dialogue online in order to rally “super fans.” These “super fans” will promote your cause, or business on their own. Check out the examples of J.Crew and LUNA. The J.Crew example also reminds us that ideally online and offline communication should be consistent. 6. Experiment, and learn and adapt quickly, as referenced in Beth Kanter’s The Networked Nonprofit. Regardless of whether or not it works, it is a learning experience.